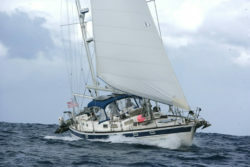 Sailing the Grenadines with a crewed charter yacht. 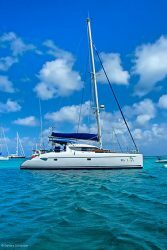 Sailing the Grenadines with a crewed charter yacht is by far the best way to discover the islands, you board your yacht of choice, and enjoy the cruise! No need to pack and unpack, wait for ferries (if any and not out of order) or uncomfortable speedboats (weather permitting), just settle in and let the experienced crew do the rest. Of course you can do as much or little you want on board, take the helm, hoist the sails, learn navigation or just relax and absorb the beauty of the Grenadines. Most of our listed yachts are eventually more affordable than bareboat rental. 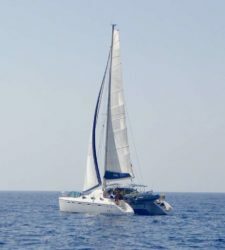 The latter may look cheaper at first sight, but wait till you figure out all the additional costs such as food, drinks, a one way itinerary, a skipper or even a chef, insurance…. All of those are generally included in our yacht rates. Best of all, you have no responsibility sailing or operating the yacht, provisioning (which can be a bit of a challenge in the Grenadines), cooking, the dishes etc. though you are welcome to participate. 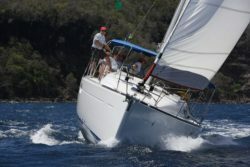 A 42 ft Jeanneau Sun Odyssey. Exhilirating sailing performance! Crew born and raised in Bequia, very experienced. Local knowledge! Very solid, safe and seaworthy yacht. Luxury interior accommodates up to 6 guests in 3 cabins. All inclusive, even AC included! Multilingual Swiss crew welcoming you to share the dream. 73 ft Caribbean "classic" wooden schooner. Accommodates up to 7 guests in 3 cabins. 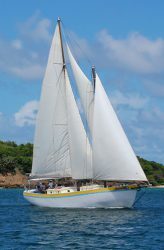 Built traditionally by shipwrights in Carriacou she combines a true Caribbean sailing experience with modern and spacious accommodations both on and below deck. Very experienced highly qualified English/French crew. 40 ft well maintained Fountaine Pajot Lavezzi catamaran. 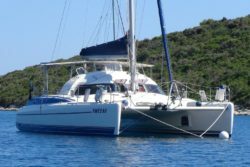 Accommoodation is ideal for 1 couple: you get the entire spacious starboard hull to yourselves! Also very suitable as a family boat where you get the entire port hull to yourselves. With 2 couples crew shares one bathroom. Canadian crew. Qualified to teach you all about sailing and boating in general if you wish. Great food, freshly caught if possible. A 53 ft Pearson. A solid, safe and fast ocean going yacht. 37 ft Fountaine Pajot Athena. Private charter for 1 couple! Youngish Austrian crew speak German and English. International cuisine often featuring the BBQ. $4200/2 per week, shorter charters possible.